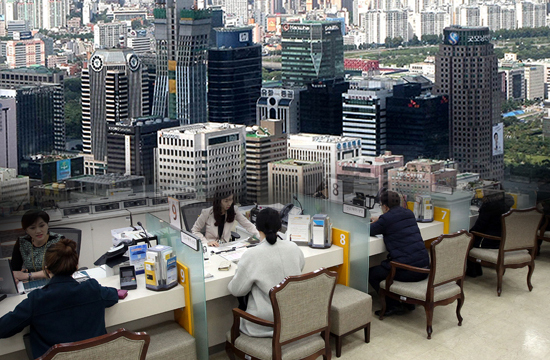 Short-term bank saving has been surging in South Korea as the cash-rich have few options to park their money amid volatility in the stock and real estate market. The balance of deposits with six months to one year in maturity went up 14 percent and that with one to two years rose 9 percent over the same period, meaning that consumers opted to keep money in banks that pay little interest. The trend pushed the balance of fixed deposits in banks to an all-time high to 694 trillion won in late 2018, up 12 percent on year and overwhelming the growth of 3 percent in 2016 and 5 percent in 2017. The balance in demand deposits, a type of account where depositors can withdraw funds at any time without any conditions, has also been on the rise. The amount of money placed under demand deposits in the nation’s five major commercial banks – Shinahan Bank, KB Kookmin, Hana, Woori and NH Nonghyup – increased to an eight-month-high of 467.15 trillion won as of the end of February. The amount is the largest in eight months. Market analysts suggest that consumers have chosen to keep their money at easily cashable accounts due to the lack of investment options at a time when the stock market is showing high volatility, whereas the real estate market has slumped on state clampdown on speculative purchases. Banks have also been promoting fixed deposit accounts as they have to increase deposits under the tightening loan-to-deposit ratios. But some have raised concerns that the weak investment sentiment and tight money flow can aggravate the lethargic economy.